If someone were to ask me my favorite pizza topping, I'd have to say pineapple. There's something about that juicy, sweet ingredient that combines perfectly with the salty cheese, tart sauce, and bready crust, at least to my palate. Coming in right behind pineapple would be green peppers--I like their subtle zip and crunch! There are many options for frozen pizza these days, ranging from your bargain brands to the fancier varieties that are likely to cost almost as much as a fresh pizza. When I'm staring at the freezer case, Freschetta is what ultimately goes into my cart. It's made with high quality ingredients like 100% real provolone and mozzarella cheese and sauce that comes from sun-ripened tomatoes. The crust rises naturally with no chemical leaveners. Freschetta believes that you should feel good about what you serve to your family, and I agree. 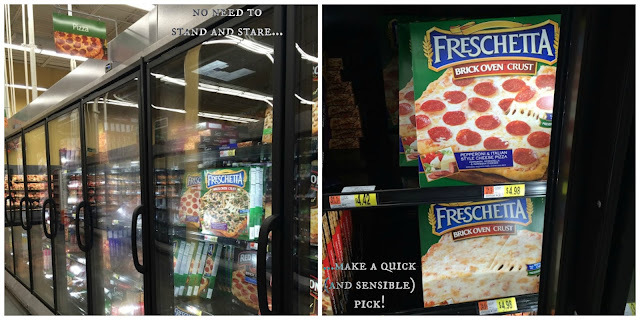 Though Freschetta has a Canadian Bacon & Pineapple pizza (not to mention Brick Oven Mushroom & Spinach and Naturally Rising Sausage & Pepperoni, among others), I got two basics at Walmart to pair with my pineapple and pepper salsa--5-Cheese and Pepperoni. What a great combination--a bite of gooey cheese pizza chased with a scoop of sweet pineapple and spicy jalapenos just makes a mouth rejoice. I should note that the jalapenos I used were the very first to be picked from our garden, and they were SMOKING hot! So...handle with care, folks. Handle with care. Find out more about Freschetta on Facebook and Twitter! In a large bowl, combine pineapple, bell and jalapeno peppers, basil, and toasted pecans. Add lime juice and zest and cumin and toss to coat. Let the salsa sit at room temperature or refrigerated for 30 minutes or so to let the flavors marry. Serve with tortilla chips (or a spoon!). Pineapple is my favorite topping on pizza too. I might have just dropped a big spoonful of the yummy salsa on top of the pizza and devoured it. YUM! We adore pineapple and anything made with it. Your salsa looks great! This dish looks incredibly tasty, thanks for the share! I too like pineapple on my pizza...the pineapple salsa looks great...like the fresh basil in it...is sure sounds delicious. I bet your salsa is delicious, I made a mango one last week and we ate it all in 2 days.Great idea to use on pizza. A delicious summer salad. I love sweet and spicy. Pineapple is mediocre for me, but I do love it on a pizza. And, I love the sounds of your salsa recipe. Pineapple just may be moving on up in my book! Grace, my favorite toppings on pizza are pineapple, ham and green olives! I agree about the sweet/salty ingredients being the best combo. Love fruit salsas too and your pineapple salsa sounds fantastic! !